The Nature of Personal Reality (eBook) - Amber-Allen Publishing, Inc. 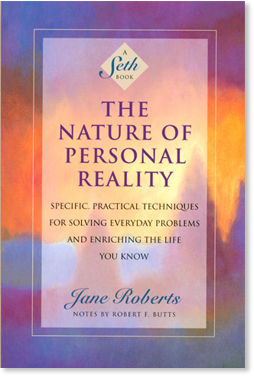 In The Nature of Personal Reality, Seth stresses the individual’s capacity for conscious action, and provides excellent exercises that show us how to apply his empowering insights to any life situation. The living picture of the world grows within the mind. The world as it appears to you is like a three-dimensional painting in which each individual takes a hand. Each color, each line that appears within it has first been painted within a mind, and only then does it materialize without. In this case, however, the artists themselves are a portion of the painting, and appear within it. There is no effect in the exterior world that does not spring from an inner source. There is no motion that does not first occur within the mind. The great creativity of consciousness is your heritage. It does not belong to mankind alone, however. Each living being possesses it, and the living world consists of a spontaneous cooperation that exists between the smallest and the highest, the greatest and the lowly, between the atoms and the molecules and the conscious, reasoning mind. All manner of insects, birds and beasts cooperate in this venture, producing the natural environment. This is as normal and inevitable as the fact that your breath causes a mist to form on glass if you breathe upon it. All consciousness creates the world, rising out of feeling-tone. It is a natural product of what your consciousness is. Feelings and emotions emerge into reality in certain specific ways. Thoughts appear, growing on the bed already laid. The seasons spring up, formed by ancient feeling-tones, having deep and abiding rhythms. They are the result, again, of innate creative aspects that are a portion of all life. The body of the earth can be said to have its own soul, or mind (whichever term you prefer). Using this analogy the mountains and oceans, the valleys and rivers and all natural phenomena spring from the earth’s soul, as all events and all manufactured objects appear from the inner mind or soul of mankind. The inner world of each man and woman is connected with the inner world of the earth. The spirit becomes flesh. Part of each individual’s soul, then, is intimately connected with what we will call the world’s soul, or the soul of the earth. The smallest blade of grass, or flower, is aware of this connection, and without reasoning comprehends its position, its uniqueness and its source of vitality. The atoms and molecules that compose all objects, whether it be the body of a person, a table, a stone or a frog, know the great passive thrust of creativity that lies beneath their own existence, and upon which their individuality floats, distinct, clear and unassailable. So does the human individual rise up in victorious distinctiveness from the ancient and yet ever-new fountains of its own soul. The self rises from unknowing into knowing, constantly surprising itself. As you read these sentences, for example, some of your knowledge is conscious knowing and is instantly available. Some is unconscious, but even the unconscious knowledge is knowing in its own unknowing. You always know what you are doing, even when you do not realize it. Your eye knows it sees, though it cannot see itself except through the use of reflection. In the same way the world as you see it is a reflection of what you are, a reflection not in glass but in three dimensional reality. You project your thoughts, feelings, and expectations outward, then you perceive them as the outside reality. When it seems to you that others are observing you, you are observing yourself from the standpoint of your own projections. You are the living picture of yourself. You project what you think you are outward into flesh. Your feelings, your conscious and unconscious thoughts, all alter and form your physical image. This is fairly easy for you to understand. It is not as easy, however, to realize that your feelings and thoughts form your exterior experience in the same way, or that the events that appear to happen to you are initiated by you within your mental or psychic inner environment. Your body does not just happen to be thin or fat, tall or short, healthy or ill. These characteristics are mental, and are thrust outward by you upon your image. I do not mean to be facetious, but you were not born yesterday. Your soul was not born yesterday, in those terms, but before the annals of time as you think of time. The characteristics that were yours at birth were yours for a reason. The inner self chose them. To a large extent, the inner self can even now alter many of them. You did not arrive at birth without a history. Your individuality was always latent within your soul, and the “history” that is a part of you is written within unconscious memory that resides not only within your psyche, but is faithfully decoded in your genes and chromosomes,* and fulfilled in the blood that rushes through your veins. You are aware, alert, and participating in many more realities than you know as your soul expresses itself through you. That consciousness of your usual daylight hours, the ego consciousness, rises up like a flower from the ground of the “underneath,” the unconscious bed of your own reality. Though you are not aware of it, this ego itself emerges, then falls back again into the unconscious, from which another ego then rises as a new bloom from the springtime earth. You do not have the same ego now that you had five years ago, but you are not aware of the change. Ego rises out of what you are, in other words. It is a part of the action of your being and consciousness, but as the eye cannot see its own shifting colors and expressions, as it is not aware that it lives and dies constantly as its atomic structure changes, so you are not aware that the ego continually changes, dies, and is reborn.